On Monday, the first day of the new Thai calendar, we sailed with 27 divers from all over the world to Phi Phi Island. The first dive at Ko Doc Mai was beautiful as ever with Seahorses and Ghostpipefishes. After this dive we headed to Phi Phi Island enjoying fabulous lunch and beautiful weather. At 1:30 pm we started the second dive of the day at Ko Bida Nok, south of Phi Phi Lee Island. Just a few minutes into the dives he showed up; he the largest of all living Sharks and the largest living fish species – the Rhincodon typus better know as whale shark. The 6 Meter long Fish stayed with most of our divers for 30 Minutes. What a great experience and than directly for half an hour, great! 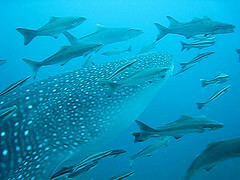 Did you know that the longest ever measured whale shark was reported 13,7 Meter long. Whale sharks can weight up to 12000 kg and they can reach an age of up to 100 Years. The whale shark is a filter feeder and it feeds on plankton and other nektonic like. Therefore the shark constantly pumps water over its gills with a rate of 6000 Liter per hour. As a filter feeder, it has a capacious mouth which can be up to 1.5 Meters wide and can contain between 300 and 350 rows with up to 3600 tiny teeth. This species, despite its enormous size, does not pose any significant danger to humans and for divers is the highlight of every divetrip.